Guys, you won't believe it, but check this out. The world's my longest running UFO is now an FO. I can't even believe it. Yarn: sock yarn. Lots and lots of teeny balls of sock yarn. No earthly idea on the yardage, but I've still got a crap load left, so I'm not sure this was the ultimate stash buster I was hoping for! Start/finish: this is where it gets impressive. 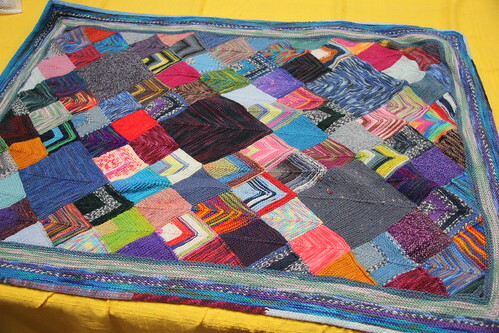 I cast on for the first squares on 16 April 2008. I was originally intending to give this to Boo for Christmas in 2008. Then it was going to be for her second birthday. Then we moved and it migrated to the bottom of my laundry hamper of ongoing projects. And I tried desperately to forget about it. 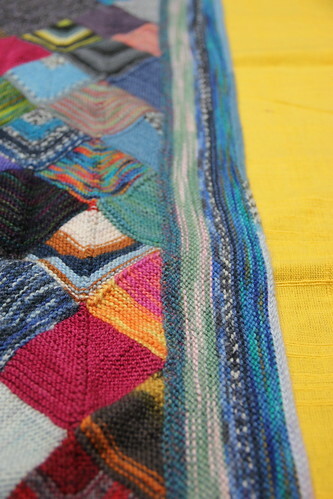 Well, as I got to the end of the River Run pullover (I swear I will blog this soon! ), I had a hankering for mindless garter stitch, so I pulled this out again. The last few squares didn't take all that long, and then I had to figure out how to fill in the sawtooth edges. I had grand designs on being really fancy and matching the mitering on the main squares. After much mental gymnastics I decided it was too complicated and I picked up stitches along one side of the sawtooth, and decreased/attached to the other edge on every other row. Easy peasy. Then I picked up one stitch for each garter ridge along the edges, and worked about 3 inches of border, increasing two stitches at each corner to make a point. 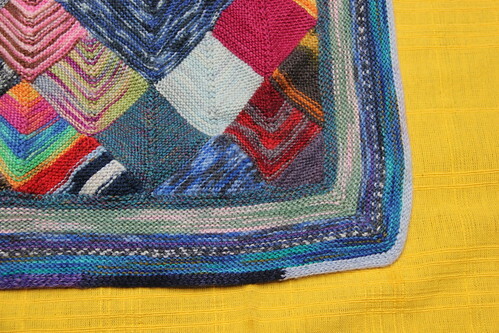 Then came the attached I-cord edging, which I thought would drag on forever, but actually flew by. I did a 5 stitch i-cord, which made for a nice ~0.5 inch edging. 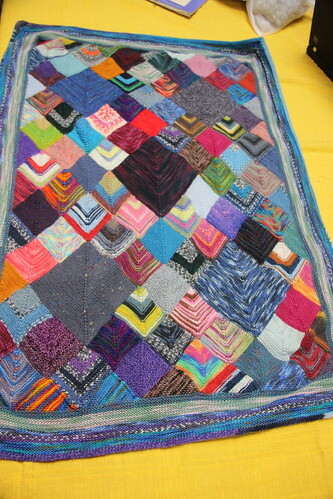 Then came the weaving in of the ends. This thankfully coincided with my tendonitis flare up that meant I couldn't really knit, so those suckers took a couple of evenings and four episodes of "Game of Thrones". I was going to put a fleece backing on it so I didn't have to weave in all the ends, but someone got impatient and didn't want to wait any longer. Fair enough. Final finished date: 15 April 2012. Yup, you're looking at a four year project. Seem's like maybe it should be a bit more impressive, doesn't it? Done, dusted. Boo has named it "Colorful" and had to be distracted with TV so I could take it away for some photographs. I call that a success. I am thrilled to be finished with it. 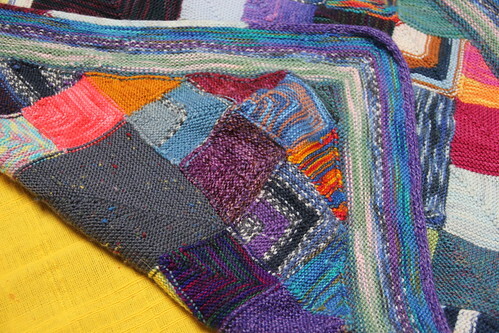 And I love that we can spread it out and identify squares that are from yarn from socks that I've knit for the family. There's yarn from Nana socks, Grandpa socks, Mermaid and Koala socks, Uncle socks, Auntie socks, Mummy and Daddy socks, as well as handspun yarns, yarns from friends in Houston, and yarns from socks I've made since we've been in the UK. A whole (more then) four years worth of memories to keep her warm. Devil will be getting a blanket as well, some time in the future, but it will be out of worsted weight yarn, if I have anything to say about it. It might end up being worsted weight handspun, but so be it! And my piles of sock yarn scraps are destined for some really entertaining mis-matched socks and some baby gear for upcoming sproglets (not mine). Hooray! 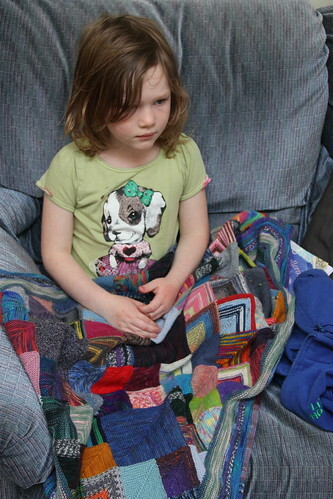 Written by porpoise On April 18, 2012 In "FO", "Sock Yarn Blanket"